And she is the co-author of Shakespeare for Kids, His Life and Times. Future MB Publishing titles include the picture books Busy Bunnies and Snowy Bunnies (illustrated by June Goulding) and No Naptime for Janie: A Hanukkah Tale (illustrated by Renée Andriani, Fall 2017), as well as the third Jake McGreevy Novel, Paris Plunder. 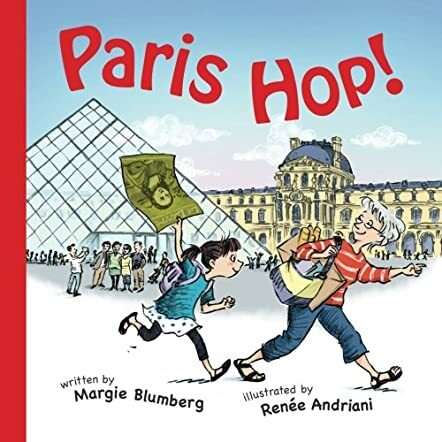 Paris Hop!, written by Margie Blumberg and illustrated by Renée Andriani, is a story about Grandma taking her granddaughter to the Eiffel Tower on a visit to Paris. They are determined to see how the city looks with the sun shining over it, but they continue to get distracted by the other wonderful places and sights of “Paree,” such as museums and clothing stores. Will they be able to make it there before the sun sets? And if they don’t, how will their day trip to Paris end? This was a cute little story that children and their parents (and grandparents) will thoroughly enjoy. While children will enjoy the entertaining rhyming quality of the book, they will also have fun learning common French phrases. Parents don’t need to worry about mispronouncing or not understanding these phrases because there is a very helpful glossary in the beginning of the book that clearly states the meaning and the pronunciation for each word and phrase. And the actual story is just so charming. I adore the idea of a grandmother and her granddaughter exploring Paris together. Children will get to experience the culture of Paris through the many stops this young girl and her grandmother make. Plus, the illustrations make it that much more delightful. The vibrant colors and adorable images will keep children engaged and wanting to read the book over and over again. Margie Blumberg definitely has a new fan, and I’m sure that Paris Hop! will be among my daughter’s favorites. Armed with their binoculars and a map, Grandma and her granddaughter set out for a fun day in Paris, and to experience the beauty of Paris from the Eiffel Tower. However, on their way to the Eiffel Tower, they are diverted several times by the beauty of the city. First they pop into a bakery to enjoy some delicious goodies, then they get their picture painted, sit down to enjoy the puppet show in the park, go shopping and even enjoy a boat ride, plus many other fun activities. Their main aim, however, is to see how beautiful Paris looks from the top of the Eiffel Tower, bathed in beautiful sunlight. By the time they are done with all the fun, however, the sun has already set and they have not yet reached the Eiffel Tower. They need to make a decision whether to continue to the tower or not, and when their decision is made, they are in for a very big surprise. Paris Hop! by Margie Blumberg is a fun children's story that demonstrates the beauty of Paris, as seen through the eyes of a grandmother and her granddaughter in one day. As the pair moves through the city, enjoying the beautiful scenery and fun activities, you can feel their excitement with each new discovery. Margie Blumberg created vibrant characters and brought the story to life through their dynamic behaviour and enthusiasm. The vivid illustrations add to the fun of reading the story and make you enjoy the adventure even more. Paris Hop! by Margie Blumberg is an easy and fun way for kids to learn about the beautiful scenery and lifestyle in Paris, and even add some French words to their vocabulary. The book also teaches kids an important life lesson; as you chase the big goals, it is important that you do not miss out on the small things along the way. Paris Hop! is a children's picture book written by Margie Blumberg and illustrated by Renee Andriani. The story is about a young girl's day in Paris with her grandmother. There's so much to see in Paris, but grandmother especially wants to show her granddaughter the city from high up in the Eiffel Tower with the sun shining from above. The two keep up a steady pace as they go, but there are so many things that make them want to stop for just a minute. There's a puppet show, an artist who wants to paint their portrait, a bakery, a boat ride and the museum where the Mona Lisa hangs. As they fly through the city, they see the most amazing sights, but nothing quite compares with the sights they see when they finally do reach the Eiffel Tower. Margie Blumberg's picture book, Paris Hop!, is a fast-moving and exciting touring book for children which introduces them to the highlights of Paris as seen through the eyes of a grandmother and her granddaughter. It's fun to watch them charge through the city and get side-tracked by all the sights and sounds of Paris. Renee Andriani's illustrations are a masterful blend of pen and ink and lush coloring, and they bring the city to life. Her Eiffel Tower paintings are really remarkable and help make reaching the final destination a fabulous experience. Blumberg also interjects just enough French words and phrases to give the reader a real French experience. Her glossary gives definitions and very simple pronunciation guides to enable everyone to easily and correctly speak the French they encounter in the story. Paris Hop is fun and perfect for armchair adventurers.